Fast Assemblers’ furniture dismantling services come in handy for many Londoners moving their furniture from and to their home or office. The number one rule for any kind of furniture relocation is always to disassemble the heaviest and biggest furniture pieces. Transportation becomes less risky when your furniture is safely stored in boxes instead of being in one piece. The chance of breaking or scratching your furniture is much lower. By hiring Fast Assembler’s London furniture disassembly service you save yourself a great deal of time and nerves. 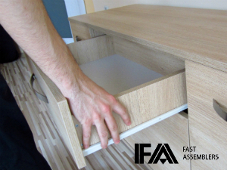 Fast Assemblers has professional furniture builders at its disposal. They have years of experience in dismantling and reassembling any type of furniture item without damaging them. They work fast and with guaranteed quality, so you can rest assured your furniture will stay the same after the reassembly. Fast Assemblers cover all London areas, so regardless of where you’re moving to or where you’re at the moment, you can rest assured you will receive the full benefits of our services. Disassembly and reassembly specialists will come to your address at the prearranged time and will take care of your furniture pieces with diligence and speed. Call Fast Assemblers – Book Our Furniture Disassembly And Reassembly Service NOW! Don’t waste any more of your time and book with us now! Let Fast Assemblers provide you with complete service of dismantling your movables so you can safely pack, transport and store them hassle-free. Check out the areas that we cover. Visit our prices page to check out how affordable our services are! Call us on our 24-hour hotline 020 3746 1134 and talk with one of our helpful customer support staff members. You will be provided with a free price estimate for the services you request. You can also schedule an appointment online as well – just complete our booking form.